How much money do you think you waste per week? Per month? Per year? 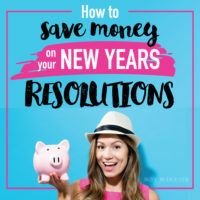 I was shocked when we did things to intentionally reduce our spending and I found that in the first year we’d saved just shy of $24,000. What’s really amazing, though, is that to save that money, we didn’t really do anything drastic. There were a few growing pains as we got used to our new habits, but nothing we cut out of our budget felt super restrictive. In fact, it was pretty freeing saving that money, reducing debt and putting it toward what was more important to us! If you’re struggling to stay afloat financially and overcoming debt, take heart and know there are totally ways you can do it – and they’re probably way more painless than you thought. Visit MakingCents for clear, step-by-step information to help you meet your financial goals. You might hear this a lot with money-saving articles, but there’s a reason for it: it’s one of the fastest ways to reduce your spending. Eating out every day costs way more than you realize, even if you just hit up cheap fast food joints. Packing your own lunch is almost always going to be cheaper, especially if you make use of leftovers/other inherently cheap ingredients. The other benefit is you’re going to be healthier. The lunches you pack will most likely be a lot healthier and lower-calorie than you’d get eating out. The health benefits could spell out some long-term savings on medical costs, which is always awesome. Even if it’s hard to get used to, brown bagging it is totally worth it. When it comes to other meals, do yourself a favor and plan them in advance! There are lots of simple ways to do so. FreezEasy is where I recommend most people start because it’s so simple and takes an hour every two weeks to make the meals (seriously!) And even the membership cost is minimal. Stockpile when prices are good. Here’s where meal planning really comes into play: if you know what your family loves and uses regularly, you’ll be able to buy stuff in advance when there’s awesome deals. For example, is your grocery store having an insane sale on peanut butter, and your family uses it like crazy? Go ahead and buy a whole case, and keep it stored properly in a cool dry area. This is also great preparation for if there’s a natural disaster or if there’s a sudden loss/drop of income in general. It means you won’t be left high and dry and have to amass more debt all of a sudden. Not only is this a waste of money, it’s way better for the environment to use reusable bottles instead. And I get it if you hate the taste of plain tap water! Buy yourself a good Brita filter, set reminders in your phone for when the filters need to be replaced, and use that instead. You’ll recoup your upfront cost in no time at all! Plus, there’s lots of super cute reusable bottles out there – and when you consider the cost savings, you might be able to splurge on one you really love and are 100% sure you’ll use. Use coupons (with a caveat). Coupons are great! Saving money on stuff you’re already planning to buy is awesome. And the fact that they pretty much come straight to you in the mailbox? Awesome. When it comes to online shopping, it’s even better. I actually never buy anything online without checking if there’s a promo code available first. The catch is, you need to make sure you’re only using coupons on what you were already planning to buy, or you’ll end up buying stuff you don’t need, or straight-up don’t use – so think critically before you buy something way out of the ordinary just because it’s a great deal. In the day and age of Pinterest, you can find endless tutorials for DIY cleaning products. Whether you need an all-purpose cleaner, laundry soap, or stuff to clean your toilet/bathtub, you can find someone industrious enough to have figured out a DIY alternative. The simplest cleaner to start with is an all-purpose cleaner made from vinegar and citrus peels. Just put the vinegar and some orange or lemon peels in a jar for a 2-3 weeks, strain the mixture, put in a spray bottle, and dilute to about half with water. Bam – fantastic all-purpose spray cleaner! If you’re a major germaphobe, don’t worry, because the vinegar kills germs. And if you hate the smell of vinegar, don’t worry either because the lemon or orange peels make it smell great! But considering a bottle of vinegar is like $1 and a lemon can be had for 30 cents or so, it’s a huge cost savings over traditional cleaners. And that’s just one recipe out of hundreds you can find out there. Did you know there are companies that will deliver your prescriptions through the mail at a huge cost savings? Seriously. It’s awesome. In addition, most health insurance companies partner with at least one to offer an additional discount, meaning you’ll save a lot of money on your medications – plus you won’t have to spend the gas money to pick them up! If your health insurance doesn’t have any they partner with, I definitely recommend PillPack. They deliver your medications pre-sorted by dose, which is a huge time-saver if you have a lot of daily medications! Don’t make the mistake of overlooking thrift and discount stores when you’re buying new clothes. There are great finds to be had. I’ve even found name-brand stuff with the tags still on, which is always super exciting. It’s especially good when it comes to kids because they outgrow stuff so fast – including toys and books, which can be had for a fraction of the cost at thrift stores and cleaned. If you’re not into the hunt of thrift stores (and I get it! ), you might try to find a local consignment store. The prices will generally be a little higher than a thrift store, but they’ll usually look over clothes for stains and holes before reselling. It makes the process a little easier sometimes and still saves a lot of money. In theory, a gym membership is a great investment. It could help you work out and stay healthy, and it’s a great de-stresser. Sure, I get it. Thing is, there are so many alternatives to a gym membership that it might not be worth it. Even just going for walks, running, or cranking out a few push-ups while your kids play on the playground are great and free alternatives. Also, if you live in a place with an HOA that has a gym/pool, I’d definitely recommend taking advantage of the things you’re already paying for before you pay money elsewhere! Confession time: before we started really focusing on paying down debt, I spent a good $70 a week on books. I loved buying new books right when they came out, especially in hardcover – so basically the most expensive option possible. So when we started making use of our local library instead, it added up to a ridiculous yearly savings… over $3000 worth. And I considered us pretty frugal at the time! Most libraries will have any book you’re looking for, and if they don’t, ask! They might be willing to add it to their collection or borrow it from another library. If you’re more into e-books or audiobooks, a lot of libraries have systems that allow you to check those out, too, so don’t discount the option if you’re more into digital copies. If you’re into a treasure hunt, you might also look for Little Free Libraries near you- you never know what you’ll find from these, and looking for them can be a really fun and cheap activity to do as a family! The only exception to this is books for kids. We never get books for our kids from the library, because they’ll inevitably end up torn or with juice spilled on them, which means we have to reimburse the library full price for the damaged book. So not worth it! The library isn’t just for books: you can also check out CDs. Doing this is a great why to save money over a monthly music subscription like Apple Music or Spotify. And generally, you’ll be the only one doing it, so you can renew/re-check them out pretty much as often as you like! The streaming service you choose will largely depend on what shows you want to watch. Check out what’s available on each and what your family will enjoy most. If you can’t choose, take heart knowing that even getting the cheapest plan of all 3 is cheaper than cable, though – approximately $27/month (though note that Prime is paid yearly). My husband is an avid gamer and well, games aren’t cheap. I’ve had to talk him out of a lot of purchases of the latest games his friends are buying. Sorry, Jon. Instead, we try to focus on buying games that can be enjoyed for a long time, like Minecraft or Dayz. These are games that can be played lots of different ways, so it takes longer before the fun wears off. If you’re really into the latest and greatest games, I’ve also heard good things about Gamefly. 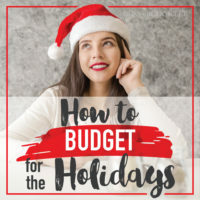 You’d have to look for yourself to determine if it’d be worth it for you and your family or not, but depending on your situation and the games you like to play, it might represent a good cost savings. When we were getting our budget under control, we suggested a $10 Christmas to our extended family, and it’s become an absolute hit. It reduces how much we have to spend each year, reduces the clutter, and makes for more meaningful and fun gifts a lot of the time! But that’s not the only way to reduce your holiday spending. You can also implement a Secret Santa tradition, or even have a White Elephant party in lieu of traditional gift giving. It really depends on your family and your priorities. Some people prioritize the materialistic side of Christmas, and that’s okay, too! It just comes down to figuring out what cuts and changes you’re willing to make. A spending freeze is exactly what it sounds like – freezing your unplanned spending for a period of time. And it’s surprisingly effective! Whether you do it for a week, two weeks, or a month (or even a year – I’ve seen it done!) 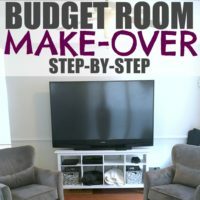 it’s a great way to get into the swing of a new budget and make you rethink bad habits. It also makes things feel more fun and less restrictive, because it’s a short-term challenge, not a forever restriction. By the end of your spending freeze, you’ll likely have a good chunk of money to use to pay down your debt. And once you’re debt free, you can use this method to quickly save for a vacation or something else that’s fun! There are lots of places you can go where you can work with a credit counselor for free to figure out the best way to reduce your spending while reducing debt. This can be helpful because it’s a third party looking in rather than you or someone else who’s personally invested – but of course that can be hard too, because you may have to face some hard truths. Like learning the truth about debt so you can deal with it and get it paid off. But ultimately, figuring out where your money is going and where it should go is a great way to make your life less stressful. One place I recommend for this service is to ​Become a Member of Navy Federal Credit Union – it’s free, and they’re super trustworthy. 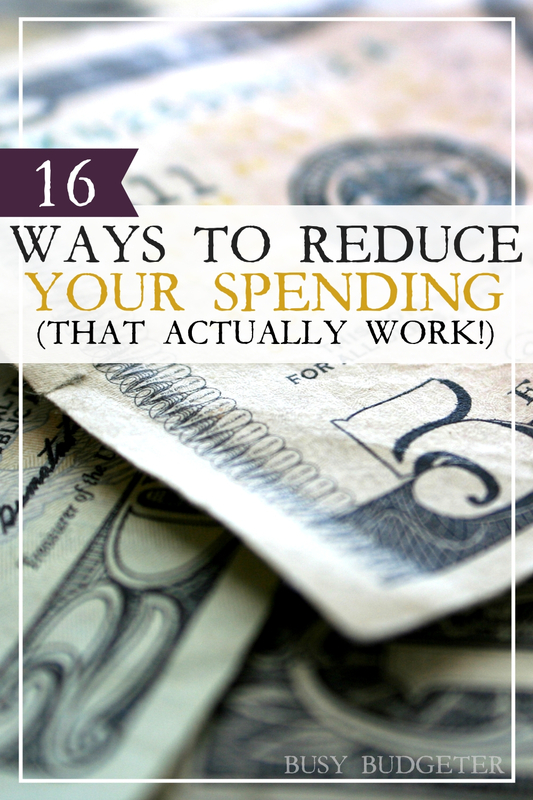 Seriously, reducing your spending doesn’t have to be a painful experience! There are a lot of super simple ways you can save money each week that, over time, will become just a normal part of your routine. I especially like the cancelling of subscriptions one… we cancelled our spotify and netflix accounts and created an automated funds transfer to our childrens’ savings accounts. Feels good to know that money we weren’t getting value from will provide greater value to them in the long term. Wow! Awesome tips! I’ve tried some of them, but not all of them. I can definitely agree that these tips work in reducing your spending! Another thing that has blown my mind with how much it saves – is using cash. I know! Sounds so antiquated, but I finally buckled down, bought a big-girl wallet and started using cash for groceries, fun money, and restaurants! Not only have my husband and I stopped going over budget in those areas, but we end the month with money LEFT OVER! It’s insane. Nothing about our habits has changed – except for using cash – and I’m continually blown away at then end of each month. Very helpful blog post, thanks for the sharing. It seriously blows my mind how much money I save by meal planning and meal prepping. What’s weird is that I think it works for me because of my constant battle against my own laziness! (…Acceptance is the first step, right?) As in, it takes a couple of hours to get everything ready on the weekend, but being able to come home from work and have dinner essentially ready in the freezer saves me so much time when I’m already exhausted – not to mention that it removes any motivation to just call for takeout. So the money saved is just icing on the (pre-prepared) cake! I have been so discouraged about my spending habit lately. I noticed that I tend to always want to eat out with my friends and it is killing me. I’m learning how to be more assertive and say no. Two things I can definitely improve on is skipping on bottled water and coupons. This is a great list! I have been trying to watch what I spend lately. My kids think money grows on trees and have me spending all my money, and then later in the month I’m always like, “Where did all my money go?” LOL! Wow! This is called truly helpful blog. Thanks for all nice tips. I would like to request author of this blog to keep sharing such write up. Great content, Thanks for sharing this post. Really nice & keep up the good work. 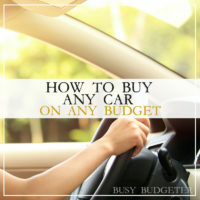 Your blog is excellent, these 16 ways to reduce your spending is very helpful for me. You know it is very important to save your money so that you can use it on bad days. I don’t understand why people spend too much of their budget on expensive meals. It is a lot better to arrange meals privately, in this way you can save a lot of money. Using your techniques everybody can reduce his/her spending and save money for a rainy day. I am a impulsive buyer and this will certainly help me. Thanks for sharing this valuable post really useful to every one. You have providing a really great stuff. keep sharing.